Comprehensive Cardiology Consultants is a private cardiology practice that has conducted numerous clinical trials within the hospital setting since 2003. 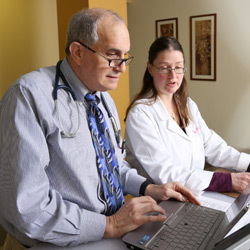 To accommodate the growing need for outpatient based trials, an office-based research center with staff dedicated to clinical research was established in 2006. Our professional staff is comprised of board-certified cardiologists, nurse practitioners, physician assistants and two RN clinical research coordinators. We take pride in successfully achieving, often exceeding our sponsor commitment to enrollment goals. We’ve created valuable relationships by consistently producing quality data to our sponsors while emphasizing the highest quality patient care for our patients. Endocrine, Migraine, Osteoarthritis, Metabolic Syndrome, Male Sexual Dysfunction, Obesity, Hypertension, and Smoking Cessation. We invite the proposal of new investigational trials that have potential for enhancement of quality care for our patient population. Feel free to contact our research office at 215.750.7818 EXT. 139, or Amy Doman RN, BSN, at adoman@stmaryhealthcare.org if you are interested in learning more about our clinical research program.